The Turks and Caicos Islands (TCI) are a British Overseas Territory consisting of two groups of tropical islands in the Caribbean. Government Non- sovereign, Overseas territory of the U.K. 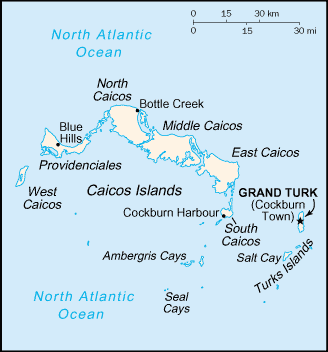 The islands of the Turks and Caicos were first populated by Carib Amerindians but, shortly after the islands' discovery – depending on the source, on 12 October 1492 by Christopher Columbus, who would have claimed them for Spain, or by Juan Ponce de León in 1512 – Spanish explorers began raiding the archipelago for slaves. Though many nations controlled the islands, official settlement didn't occur right away. For several decades around the turn of the 18th century they became popular pirate hideouts. Bermudian salt collectors were the first to settle the Turk Islands in 1678 or 1681. In 1764-1783 they were under French occupation. After the American Revolution (1763-1783) many loyalists fled to British Caribbean colonies, including (in 1783) the first settlers on the Caicos Islands; cotton became an important crop briefly. In 1799 both island groups were annexed by Britain as part of the Bahamas. There was a great deal of political turmoil surrounding the ownership of the Turks and Caicos even within the British empire: the Bahamas and Bermuda were fighting for control of the archipelago. The British government eventually assigned political control to the Bahamas, which the Turks and Caicos remained a part of until the 1840s. In 1848 they were declared a separate colony under a Council President. The last incumbent was maintained in 1873 when the islands were made part of Jamaica colony; in 1794 the chief colonial official was restyled Commissioner. On 4 July 1959 they were again a separate colony (Turks and Caicos), the last Commissioner being restyled Administrator, but till 31 May 1962 they were one of the constitutive parts of the Federation of the West Indies (see Trinidad and Tobago). By 1973 they had gained independence and their own governor (the last Administrator was restyled). They have their own government head by a Chief minister since August 1976. In 1979 independence was agreed upon in principle for 1982, but a change in government caused a policy reversal. Their political troubles in recent years have resulted in a rewritten constitution. The two island groups are in the North Atlantic Ocean, southeast of the Bahamas, north of Hispaniola, and 914 km from Miami, at 21°45′N 71°35′W. The territory is geographically part of the Bahamas, but is politically a separate entity. The Caicos Islands are separated by the Caicos Passage from the closest Bahaman islands, Mayaguana and Great Inagua. The eight main islands and more than 20 smaller islands have a total land area of 616.3 km², primarily of low, flat limestone with extensive marshes and mangrove swamps and 230 miles of beaches front. The weather is usually sunny and relatively dry, but suffers frequent hurricanes. The islands have limited natural fresh water resources; private cisterns collect rainwater for drinking. The primary natural resources are spiny lobster, conch and other shellfish. The United Nations Committee on Decolonisation includes the Turks and Caicos Islands on the United Nations list of Non-Self-Governing Territories. The two distinct island groups are separated by the Turks Passage. Together with nearby islands, those two main islands form the two of the six administrative districts of the territory that fall within the Turks Islands. Grand Turk is the administrative and political capital of the Turks & Caicos Islands and Cockburn Town has been the seat of government since 1766. The islands were under Jamaican jurisdiction until 1962, when they assumed the status of a British crown colony. The governor of the Bahamas oversaw affairs from 1965 to 1973. With Bahamian independence, the islands received a separate governor in 1973. Although independence was agreed upon for 1982, the policy was reversed and the islands are presently a British overseas territory. The islands adopted a constitution on August 30, 1976, which is Constitution Day, the national holiday. The constitution was suspended in 1986, but restored and revised March 5, 1988. The territory's legal system is based on English common law, with a small number of laws adopted from Jamaica and the Bahamas. Suffrage is universal for those over 18 years of age. English is the official language. As a British territory, Queen Elizabeth II of the United Kingdom is the sovereign, represented by a governor. The head of government is the premier. The Executive Council consists of three ex officio members and five appointed by the governor from among the members of the Legislative Council. No elections are held; the monarch is hereditary, the governor appointed by the monarch, and the premier appointed by the governor. The unicameral Legislative Council consists of 19 seats, 13 popularly elected; members serve four-year terms. Elections were held March 4, 1999, and again in 2003. The Progressive National Party, led by Hon. Dr. Michael Misick holds eight seats, and the People's Democratic Movement, led by Derek H. Taylor, holds five seats. The United Democratic Party, led by Wendal Swann, received a small fraction of the popular vote, but not enough to earn a seat. Turks and Caicos participates in the Caribbean Development Bank, is an associate in Caricom, and maintains an Interpol sub-bureau. Defence is the responsibility of the United Kingdom. In December of 2004 the Turks and Caicos Islands sought to become a new associate member to the Association of Caribbean States article. Eight of the thirty islands in the territory are inhabited, with a total population in mid-2006 of about 32,000. One-third of the population is under 15 years old, and only 4% are 65 or older. In 2000 the population was growing at a rate of 3.55% per year, with 14.46 migrants per 1,000 population and 25.65 births per 1,000 population, offset by 4.57 deaths per 1,000 population. The infant mortality rate was 18.66 deaths per 1,000 live births and the life expectancy at birth was 73.28 years (71.15 years for males, 75.51 years for females). The total fertility rate was 3.25 children born per woman. Ethnically, the vast majority of inhabitants are black and Protestant Christian. Two-fifths of them are Baptist, one-fifth Methodist, one-fifth Anglican, and less than 2% Seventh-day Adventist. The economy of the Turks and Caicos is based on tourism, fishing, and offshore financial services. Most capital goods and food for domestic consumption are imported. The United States was the leading source of tourists in 1996, accounting for more than half of the 87,000 visitors; another major source of tourists is Canada. Tourist arrivals had risen to approximately 200,000 in 2006. Apparently the government is pursuing a two-prong strategy to get money from tourists. Upscale resorts are aimed at the wealthy, while a large new cruise ship port and recreation centre has been built for the masses visiting Grand Turk. The unemployment rate is about 10%. The territory takes in revenues of $47 million against expenditures of $33.6 million and receives economic aid, $5.7 million in 1995. The territory's currency is the United States dollar, with a few government fines (such as airport infractions) being payable in British pounds. The primary agricultural products include limited amounts of maize, beans, cassava ( tapioca) and citrus fruits. Fish and conch are the only significant export, with some $169.2 million of lobster, dried and fresh conch, and conch shells exported in 2000, primarily to the United States and the United Kingdom. In recent years, however, the catch has been declining. The territory used to be an important trans-shipment point for South American narcotics destined for the United States, but due to the ongoing pressure of a combined American, Bahamian and Turks and Caicos effort has this trade been greatly reduced. The islands import food and beverages, tobacco, clothing, manufactures and construction materials, primarily from the United States and the United Kingdom. Imports totalled $175.6 million in 2000. The islands produce and consume about 5 GWh of electricity, all from fossil fuel. The territory had about 3000 telephone lines in use in 1994. Currently, mobile phone service is provided by Cable & Wireless, using GSM 850 and TDMA and Digicel using GSM 900. The system is connected to the mainland by two submarine cables and an Intelsat earth station. There were three AM radio stations (one inactive) and six FM stations (no shortwave) in 1998. Over 8000 radios are owned across the territory. There is one television broadcast station, namely WIV TV; broadcasts from the Bahamas can also be received and cable television is available. The territory has two Internet service providers and its country code top level domain (ccTLD) is ".TC". Amateur radio callsigns begin with "VP5" and visiting operators frequently work from the islands. From 1950 to 1981 the United States had a missile tracking site on Grand Turk. In the early days of the space program NASA used it. After his three earth orbits in 1962, American astronaut John Glenn successfully landed in the nearby ocean and was brought back to land at this island. The islands have no significant railways, and 121 kilometres of highway, 24 km paved and 97 km unpaved. The territory's main international ports and harbours are on Grand Turk and Providenciales. The islands have seven airports, located on each of the inhabited islands. Five have paved runways, three of which are around 2000 meters long and one around 1000 meters long. Two have unpaved runways, two of which are around 1000 meters long and one significantly shorter. A great many of the tourists who visit the islands are Canadian. Owing to this, the islands' status as a British colony, and historic trade links, some politicians in Canada and the Turks and Caicos have suggested some form of union between Canada (a Commonwealth realm, so they already share the British Monarch as Head of state) and the British territory. In 1973, Canadian New Democratic Party Member of Parliament Max Saltsman introduced the first failed attempt at consolidating the islands. The idea was brought up again in 1986 by Progressive Conservative MP Dan McKenzie, but it was rejected by his party's caucus committee on external affairs in 1987. The committee, chaired by MP David Daubney, looked at immigration, banking, health care and tourism issues in making its decision. In 2004, Conservative MP Peter Goldring visited the Turks and Caicos to explore the possibility once more. For the islands to join Canada as a full province would require amending the Canadian constitution, which seems unlikely but may provoke provinces to reopen debate on other aspects of Canada's constitution. On the other hand, small changes to the Constitution such as renaming Newfoundland to Newfoundland and Labrador, have passed intact since 1949. The last new province, Newfoundland and Labrador, was brought into the country in 1949 by an act of British Parliament. Joining as a territory would be easier, as territories can be created by an act of federal law. In addition, its population of less than 20,000 people is considered insufficient for provincial status. However, this attitude might change should the territories of Yukon or Nunavut - with about 30,000 people each,ever become provinces. In The Island by Peter Benchley, a band of latter-day pirates based on an isolated island in the Turks and Caicos prey on passing shipping. In an episode of Thank God You're Here, Cal Wilson's sketch involved her playing Miss Caicos in a Miss Universe Pageant.